Hmmm, so do we build a catamaran? Armed with study plans, we consider this…. while the video turret starts to work, a simple subset of pressure control seems within range, the manpacks practically dance under the tutelage of their team, and we proceed with general hackage. But what to float it all? The delightful image above was provided by my friend Jean Polly in New York, showing a prototype being tested in their lily pond. Note the Qualcomm OmniTRACS satellite terminal at the stern. As you’ve probably noticed, we’ve been pretty obsessed lately with this issue of choosing a boat. 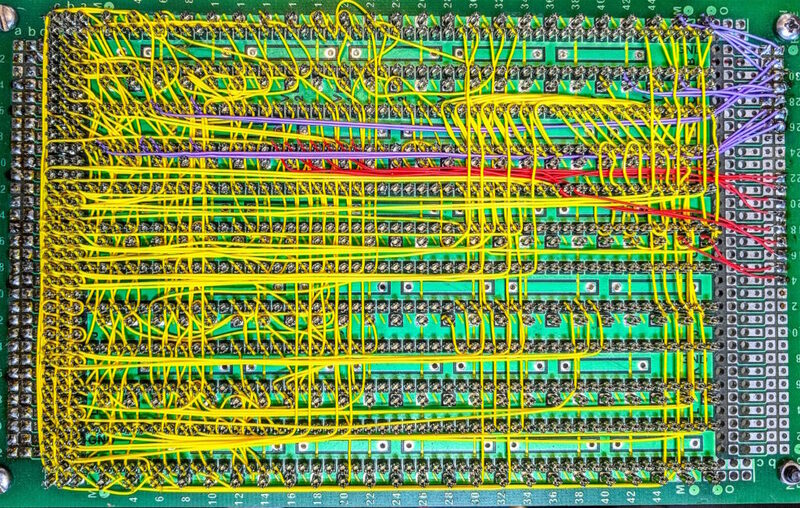 There are a lot of reasons for this — not only are we getting rather tired of calling a collection of circuit boards a “Microship,” but we’ll likely have the assistance of a team of UCSD mechanical engineering students during Spring quarter. If last year is any indication, this is something not to be missed — the video turret, a work of mechanical art, was one of these projects. I’m highly motivated to have either a boat or a full set of engineering drawings on hand by early April. You can have any two — low price, speed, or space. The three do not go together. When we add to this the need to accommodate self-trailering, stowage/deployment of two kayaks, solar panels, consoles, and a full-time nomadic couple — all wrapped up in a high-WQ package with reasonable performance and the ability to venture carefully offshore — we have a problem. In short, I have been unable to find a boat (at any price, though we’re shooting for the $teens) that meets all the design criteria and has acceptable quality and robustness. I’m not looking for heavy weather, but I don’t want to live in terror of it. We also need somewhere around 1,200 pounds of gear in addition to primary ship structure. As to the other boats we’ve recently researched — the MacGregor is a heavy unbeachable truck; the Seawind slow and wet due to wide hulls and a dragging transom. People sometimes steer us to the swift F-27, but even if we could afford one, a trailerable trimaran of that scale offers marginal space for our needs. Yesterday I had a long conversation with Kurt Hughes, a multihull designer in Seattle with whom I’ve spoken a few times over the past couple of years. I often use his portfolio as a brainstorming aid, as he has dozens of cat and tri designs ranging from playboats to serious world-cruising yachts. Somewhere between those extremes is a category of lightweight demountable economy cruisers, and he’s sending the study plans for a 30′ tri and a 30′ cat with simple tube crossbeams. 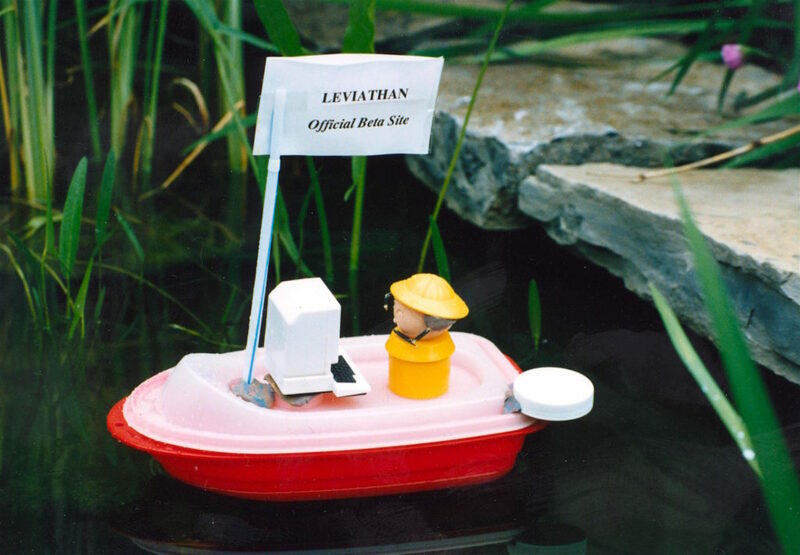 Faun initially reacted with horror to my mention of building a boat, but these are extremely simple hull forms, amenable to stitch and glue or cylinder molding construction. Besides, we can probably find a local builder who’s been down this road before — letting us minimize the learning curve and new-tool investment. I’ve heard the horror stories, so plan to approach with caution. Keep the rig simple. Breakdowns at sea are a nightmare. Stay out of heavy weather and high seas on any kind of lightweight cruising multihull. Remember: It’s YOUR life which is at risk! Sail your new boat as you would the Fulmar. Pack the boat as you would pack your bicycle. You will be making some compromises which you don’t like, but your goals require them. Always err on the side of safety at sea. I haven’t given you much in the way of control system updates in the past month — let’s look at the ongoing projects and see where they stand. Nathan Parker and Alex Burmester are making solid, steady progress. 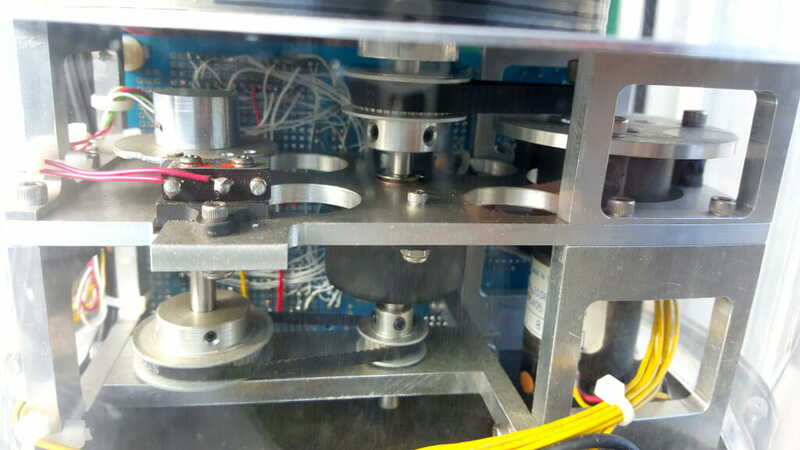 They’ve solved problems of motor driver overheating, strange squeals from the shaft-position encoder, and pulse accumulation from external vibration while stopped. This evening, they demonstrated clean motor control: the camera can be moved at any speed in either direction for any number of degrees, and it’s smart enough to deal with tricky limit problems. A single optical sensor detects the ends of travel (450 degrees of total motion), and a limit switch interrupts motor drive if for some reason the turret is driven beyond this. Due to clever planning last year on Robert Lipsett’s part (the mechanical engineer who did most of the development… full drawings are here), it is possible to statically detect whether the turret is at the clockwise or counter-clockwise limit, allowing unaided recovery from an error condition without destroying the spiral cable assembly that carries video from the two cameras into the body of the turret. Nathan and Alex have created clean code that uses the 68HC11’s hardware pulse accumulator, so it should be multitasker-friendly (this node will also need to run the pressure/temperature monitoring tasks for turret leak detection and hardware health-tracking). This exuberant trio (Filippo Loddo, Larry Conly, and Chad Neale) continues to combine steady progress with amusing antics, with the first smoke test expected tomorrow. We dedicated a Vero Speedwire prototyping board (IDC with #30 kynar as an alternative to wirewrap — low profile and much faster), which is now sandwiched with one of the New Micros 68HC11 boards. A 96-pin Eurocard connector handles all I/O from the packed logic board, carrying processor I/O (expanded via latches, buffers, and Larry’s I/O software), audio and serial crossbar signals, chord keyboard, LCD drive, security system interface, power control, and all other Manpack functions. The board also carries a DTMF transceiver (Mitel DM8880) for the auxiliary control channel over any currently-active audio link, as well as all the logic for keyboard control and signal routing. Once done, we’ll simply clone this for Faun’s backpack. Harrison Li is now working alone on this, and has been focusing on the mechanics of Hub-Node communication via the S-KEY software (which manages the interrupt-driven ring buffer for the Hub’s external serial port). Simple pass-through code (BSNET) has been working for months, but software-driven dialogues with nodes have to contend with the fact that we’re talking to console ports… which serve up all sorts of junk besides the desired data (CRLFs, OK prompts, error messages, etcetera). Harrison is trying to establish a protocol that will flexibly allow variable retrieval, Mac-node messaging, status and ‘show’ dialogues, and direct FORTH commands such as those used to control the crossbars. This is not an “official” project with the student engineers, but Jeremy Heath and I are working on packet datacomm. We brought up the PacComm Micropower-2 TNCs, with some odd phenomena such as the DCD light latching on after any packet and connect attempts apparently lodging us in CONV mode. 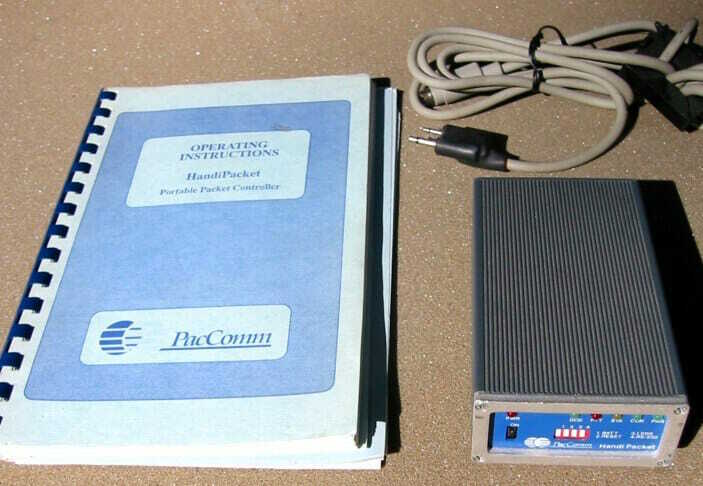 The tiny Handi-Packet is working with the HP-95 palmtop and Icom transceiver, but there are serious RFI problems. The goal here is to get basic packet operation stable, then do a hack to interface their modem-disconnect ports (J5) to the internals of our Motorola RNET 9600-baud UHF modems. This should yield high-reliability packetized communication in a very small package, with a range of about 3 miles. At the other end of the range spectrum, this afternoon I fired up the AirShare modules donated by Traveling Software as part of their LapLink Wireless package. I’m not running Windows, so can’t use their software, but the units required only power, the DTR bit on the serial port, and a couple of similarly configured comm packages. I had no problems transmitting files across the room between the HP OmniBook and an ancient Zenith 286 laptop (open-loop, no end-to-end error correction at this stage, though I suspect they would support protocol transfers… that’s next). Finally, a quick note on upcoming events. We’ll have a visit from Frank and Chris Sharp this weekend — they’re in the process of fitting out the boat Hawkeye in anticipation of full-time adventure and Faun and I anticipate some crewing to the islands this Spring. The student projects will continue to grow more frantic as end-of-quarter approaches, and on the 18th we’ll see Kirk Kleinschmidt (who wrote the QST article about BEHEMOTH) — visiting from Minnesota to discuss a shared technomadic book project. The final student presentation is March 20, then I spend 3-4 days in a French documentary filming that will involve hauling BEHEMOTH to the desert to simulate full-time touring <sigh>. Spring Break follows — and we have two dates on hold for speaking gigs in the Bay Area, currently in negotiation. Paul Picot arrives from Canada on April 9 to spend a few days helping with system design, and at about the same time we’ll be taking on a whole new team of engineering students, hopefully with a boat… or at least definite plans… on hand. And in the middle of all the above, we’re putting out monographs, enlarging our Web server, sending out proposals, questing for lab space, running a freelance business, keeping up the myriad learning curves, and developing our complex relationship (since she’s become the NRL Webmonster, you’ll all be invited to our Webbing Reception).